The desire to keep more than one species in a vivarium is common among reptile and amphibian keepers. New keepers are usually discouraged from caging different species together; experienced keepers are more likely to have the necessary skills. Though it is possible to keep a gecko and a frog together, careful species selection and planning are necessary to ensure success. When establishing a mixed-species vivarium, the first thing to consider is the cage size. The new vivarium must be at least as big as the combination of the animals’ individual cages. In other words, if the lizard requires a 20 gallons of space, and the frogs require 10 gallons of space, the habitat should be at least 30 gallons in size. All species maintained in the vivarium should be from similar climates; rainforest species should be kept with other rainforest species and desert species should be kept with other desert species. Accordingly, the temperatures, humidity, airflow, substrate and furnishings must be acceptable for all species involved. The easiest way to accomplish this is by keeping species together that hail from the same geographic area. Some frogs may eat geckos, and some geckos may eat frogs; it is important to select cagemates carefully. Additionally, aggressive animals may intimidate or harass subordinate cage mates, regardless of their species. One way to minimize conflict is to incorporate species that use the habitat differently. For example, a nocturnal, terrestrial, toad; and a diurnal, arboreal gecko will complement each other well because they won’t cross paths frequently. Conversely, two nocturnal species that spend a lot of time on the cage glass will be in frequent contact and may stress each other. Some commonly kept amphibians secrete toxins that may harm or kill cagemates. Grey tree frogs, American toads (Bufo americanus) and fire-belly frogs (Bombina sp.) all produce toxic secretions. Despite their infamous poison secreting abilities, poison dart frogs (Dendrobates sp.) are free of toxins once in captivity for some time. Wild dart frogs sequester alkaloids -- which produces the poison -- from their native prey. When deprived of these native insects, poison dart frogs lose their toxicity. Day geckos (Phelsuma sp.) are diurnal geckos that work well with a number of tropical frog species. Day geckos could be kept with medium sized, nocturnal, terrestrial frogs like tomato (Dyscophus sp.) or chubby frogs (Kaloula pulchra). Small nocturnal geckos, like house geckos (Hemidactylus frenatus) or flying geckos (Ptychozoon kuhlii) could be kept with some poison dart or mantella frogs (Mantella sp. ), as the geckos are nocturnal and the frogs are diurnal. Realize that some species may change their activity period over their life: some toads are diurnal as juveniles, but become nocturnal as they grow. Large, highly predacious geckos are a bad choice for a mixed species habitat. Tokay geckos (Gekko gecko) will consume anything they can overpower, and will make quick work of many pet frogs. 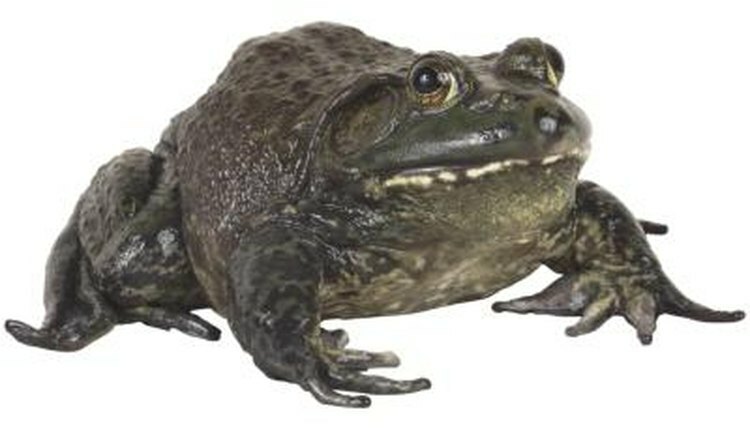 Similarly, large bullfrogs (Rana catesbeiana), horned frogs (Ceratophrys cornuta) and large toads (Bufo sp.) will eat astonishingly large prey and shouldn’t be housed with animals small enough to be consumed. Oxford Journals: Why Be Diurnal? Shifts in Activity Time Enable Young Cane Toads to Avoid Cannibalistic Conspecifics.